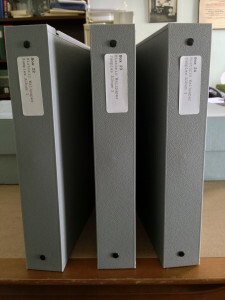 Binders full of hun­dreds of plas­tic-sleeved wall­pa­per frag­ments revealed dur­ing the restora­tion can be found in our stor­age area. This week’s top­ic in our “Peel­ing Back the Lay­ers” series looks at some of the incred­i­ble wall­pa­per that has graced the walls of Camp­bell House since its con­struc­tion in 1851. 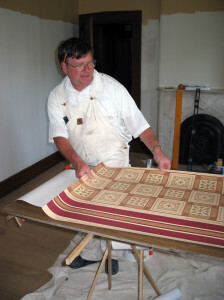 When the muse­um began its exten­sive restora­tion project in 2000, great care was tak­en to pre­serve any­thing and every­thing that was found in walls, under floor­boards, and under lay­ers of paint and wall­pa­per. Everything—from large orig­i­nal doors and win­dows to the small­est scrap of fad­ed wall­pa­per was saved and is pre­served for future study here at Camp­bell House. 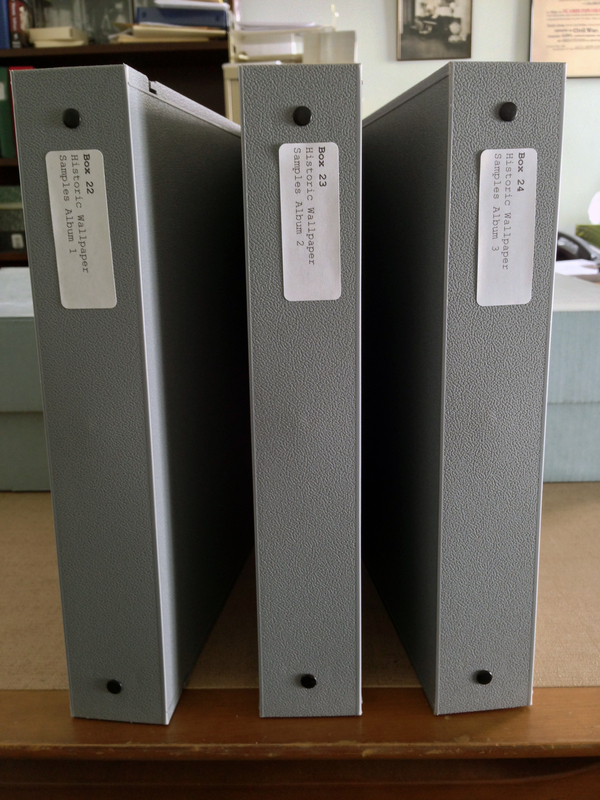 Our cli­mate-con­trolled archives room is chock-full of binders and box­es con­tain­ing all of these frag­ments. Over time, wall­pa­per itself has fad­ed in and out of style and, along with this, lots of dif­fer­ent designs saw peaks in pop­u­lar­i­ty. The first thing a lot of us think of when think of wall­pa­per might be some­thing like you see to the right. Ran­dom inter­net pic­ture of ter­ri­ble wall­pa­per. Yikes, right? 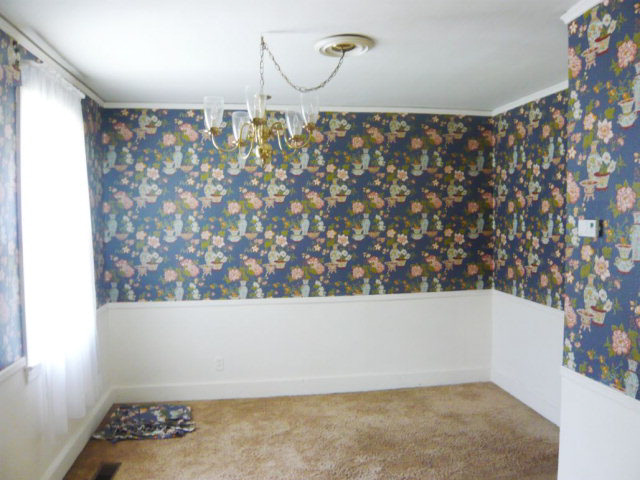 Have no fear—our wall­pa­per is way more inter­est­ing than Grandma’s din­ing room. 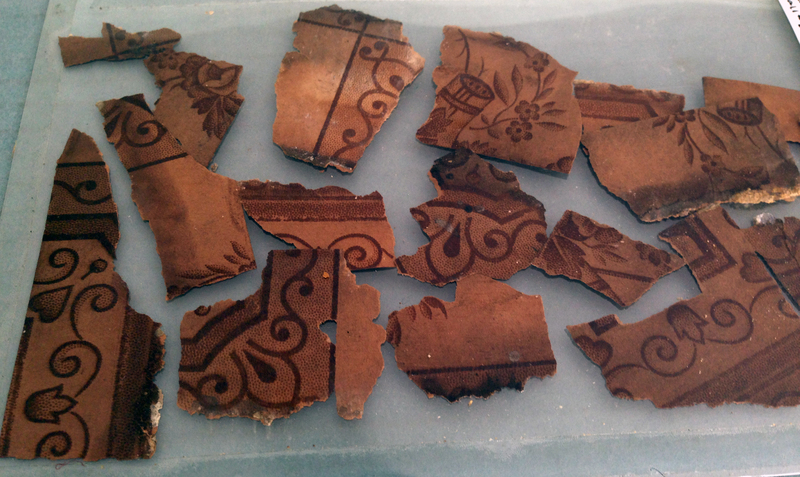 Like the linoleum we talked about a cou­ple of weeks ago, we found quite a few lay­ers of wall­pa­per­ing when we began the restora­tion. 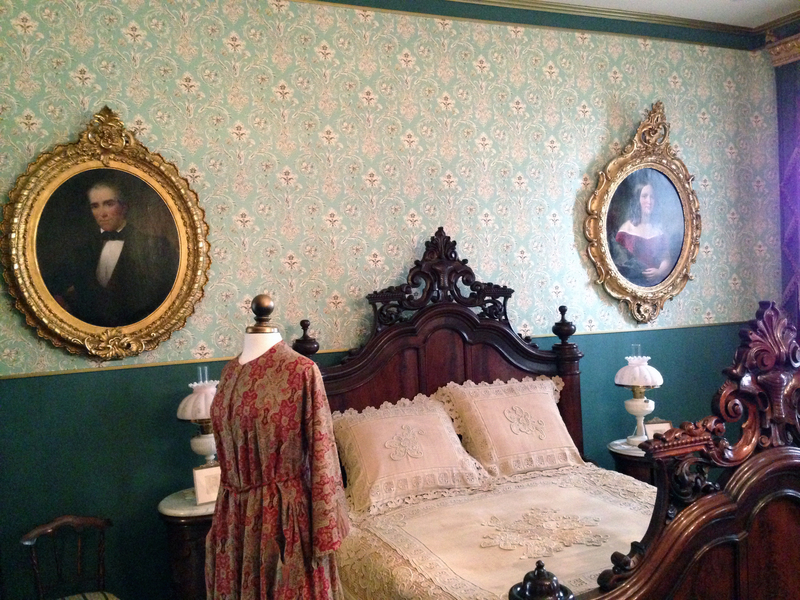 Cir­ca 1870 wall­pa­per from CHM’s 3rd floor sit­ting room, still attached to plas­ter. Wall­pa­per bor­der rem­nant from the sec­ond floor of the Car­riage House. Wall­pa­per sam­ples found in the sec­ond floor ser­vants hall with a “felt board” back­ing, dat­ing from the ear­ly 20th cen­tu­ry. 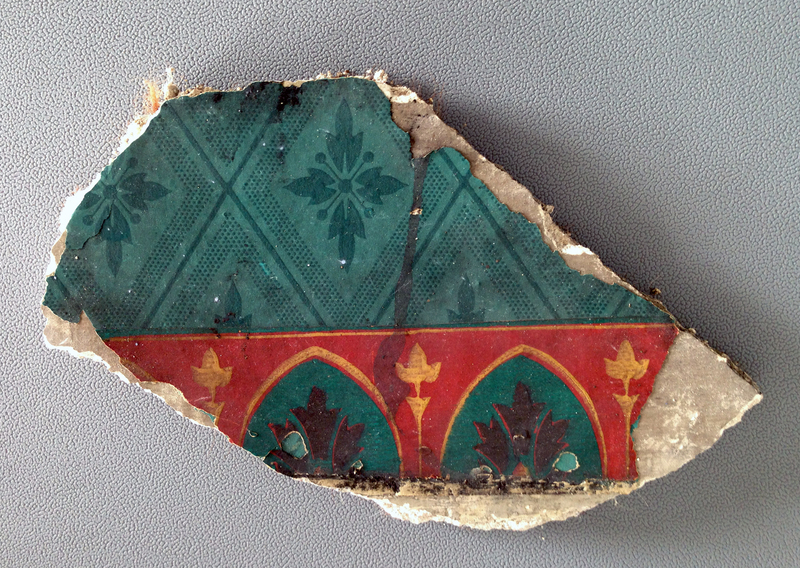 Cir­ca 1860 wall­pa­per bor­der frag­ment found in the third floor stair­well. The bor­der accent­ed an unusu­al­ly large pat­terned Ash­lar paper—designed to look like fin­ished brick or stone. 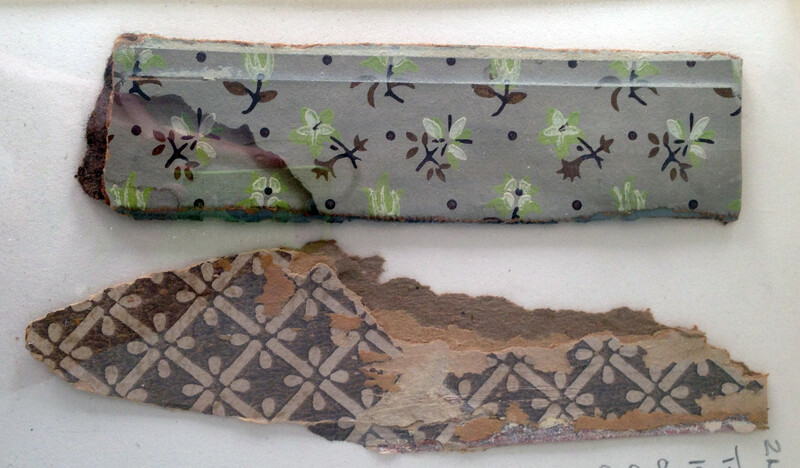 See the cur­rent iter­a­tion of Ash­lar paper found today at Camp­bell House below. 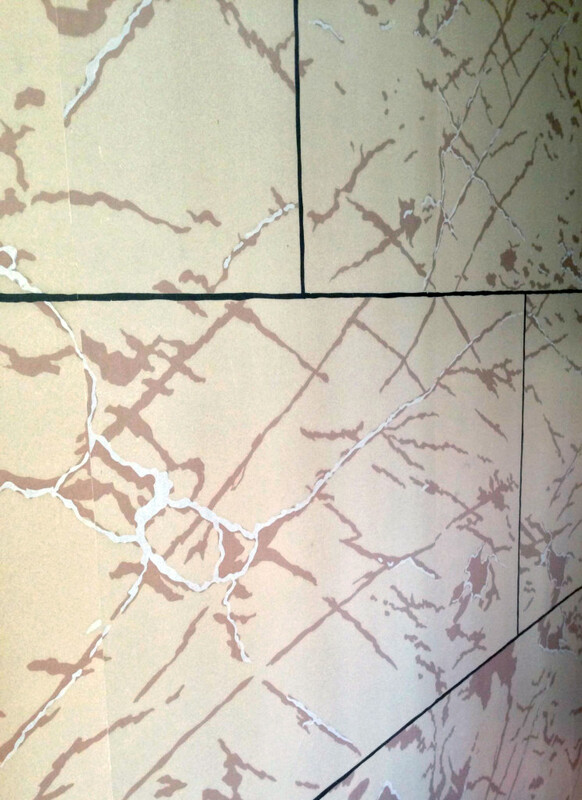 Ash­lar block wall­pa­per on the walls at Camp­bell House today- installed in the ear­ly 2000s dur­ing our restora­tion. 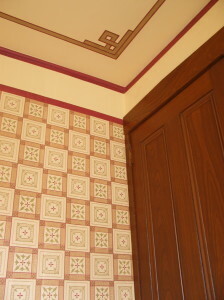 Block flo­ral motif pat­tern found under the crown mold­ing in the ser­vants hall and out­side the sec­ond floor bath­room. 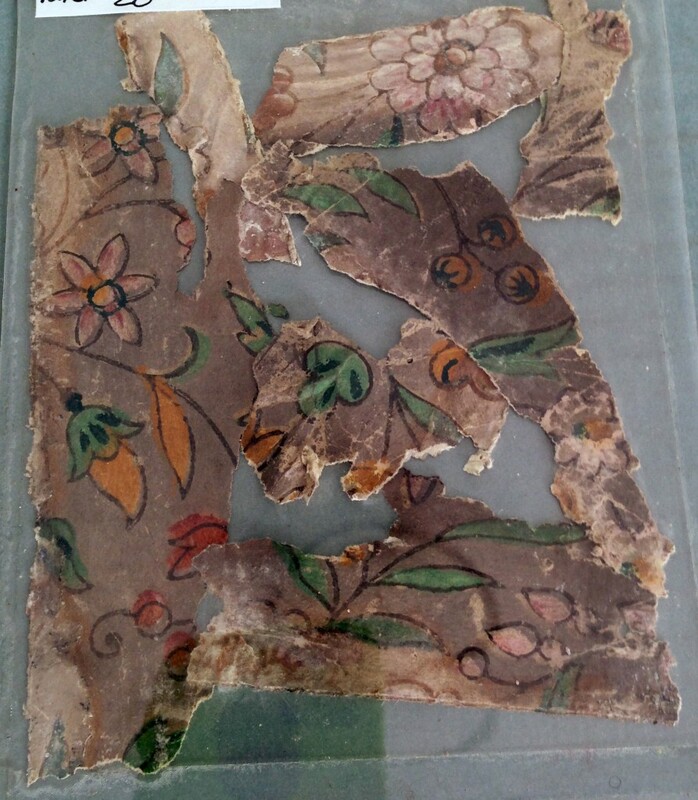 Bor­der paper frag­ment found in Mrs. Kyle’s room behind man­tle facade dat­ing from the 1860s- this like­ly pre­dat­ed the many exten­sive struc­tur­al addi­tions and improve­ments that the Camp­bells made to their home over time. Wall­pa­per frag­ment found on the west wall of CHM’s library. 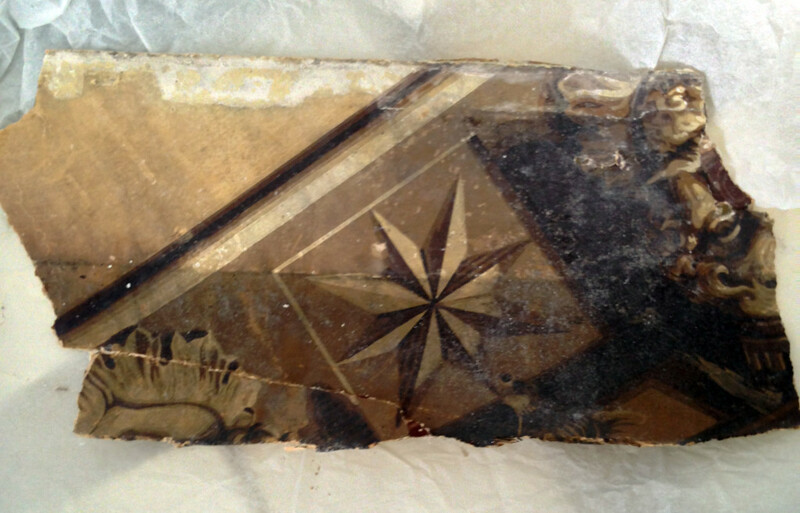 This was found behind a divid­ing wall, mean­ing it dates from before the 1880s and was installed by Robert and Vir­ginia. 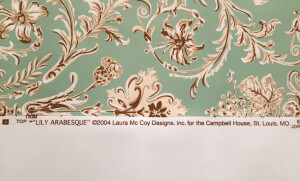 After uncov­er­ing all of those neat his­tor­i­cal pieces of wall­pa­per, we began the process of re-paper­ing with spe­cial­ly designed spot-on recre­ations of what orig­i­nal­ly hung on the Camp­bells’ walls. This was quite the process—wallpapering in the 1880s was noth­ing like what it is today. 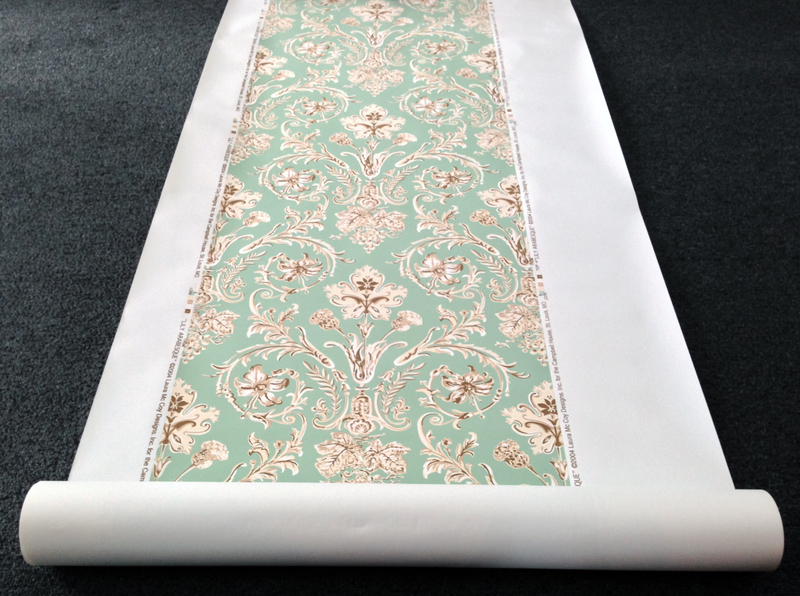 The wall­pa­per came rolled in 30 inch-wide strips. 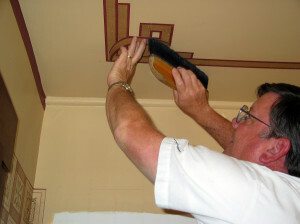 How­ev­er, the design was only on 19 inch­es of the strip, which meant our installers had to hand cut the edges of the wall­pa­per and pay extra spe­cial atten­tion to make sure edges matched up once the paper was past­ed to the walls. 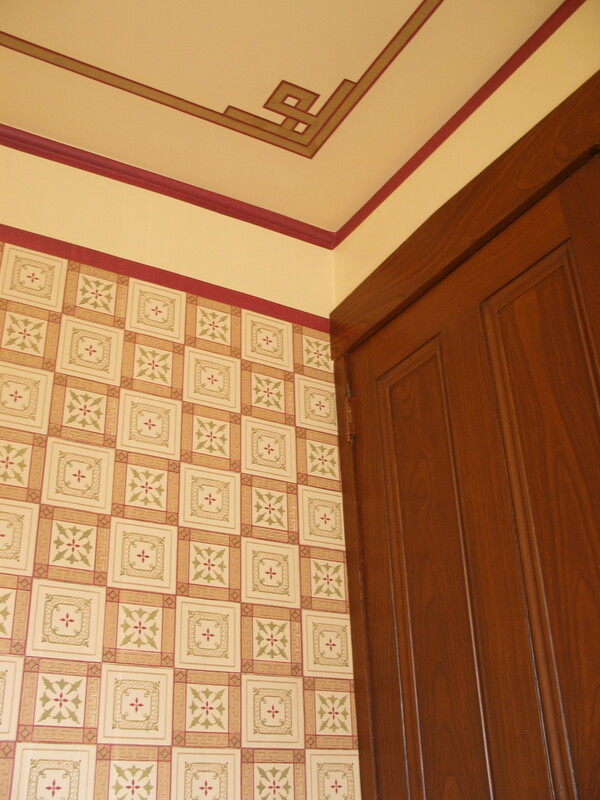 All of the wall­pa­pers used in our restora­tion were cus­tom-designed to match orig­i­nal wall­pa­pers found in the house dur­ing the 19th cen­tu­ry by spe­cial­ty design firms. 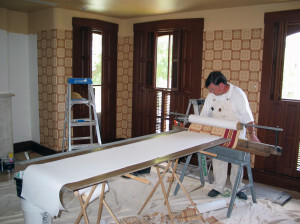 The end prod­uct: the entire wall of the Campbell’s mas­ter bed­room is cov­ered with indi­vid­ual strips that had to be hand-cut and then past­ed into place. So that sounds like quite the project, right? 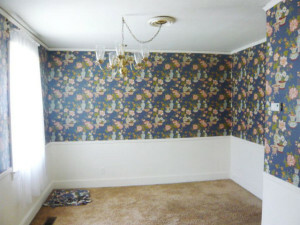 Well things got even cra­zier with the com­plex wall­pa­per and bor­der design found in Mrs. Kyle’s bed­room. Like the green lily wall­pa­per seen above, the Japan­ese-inspired wall­pa­per for this project came in small strips that had to be hand-trimmed. What made this room extra tricky, though, was the bor­der that had to be sliced off the top of the roll, past­ed, and reassem­bled by hand into a com­plex design on the ceil­ing and around the tops of the walls. Red and gold trim along the top of the wall­pa­per had to be cut off. 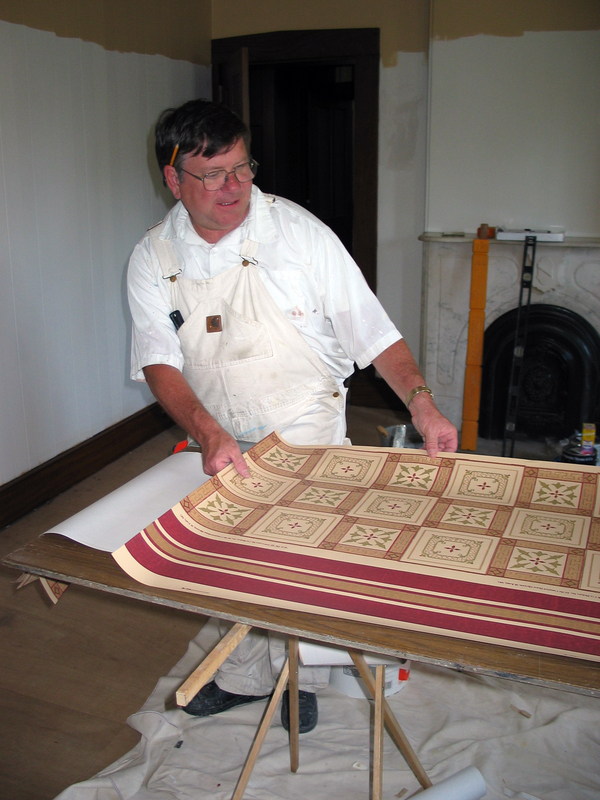 Our crafts­man del­i­cate­ly past­ing the cut-off sliv­ers of wall­pa­per into a box-design on the ceil­ing. 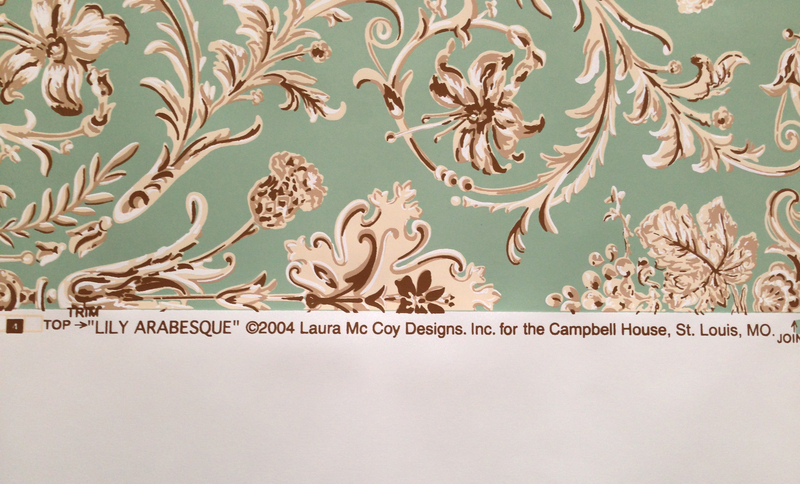 This entry was posted in Campbell, Campbell House, Decorative Arts and tagged Art, ashlar, decorative arts, design, floral, historic preservation, pattern, Restoration, wallpaper on October 16, 2013 by Andy Hahn.